The federal Food and Drug Administration has taken a big step on what’s likely to be a long legal path to slash the levels of highly addictive nicotine in cigarettes — a step officials say could save millions of lives and billions of dollars in the years ahead. Commissioner Scott Gottlieb called the agency action “unprecedented,” and said the FDA now will start consulting with medical scientists and policy-makers to figure how to better combat smoking, including with other measures to curb menthol and other flavored cigarettes and premium cigars. 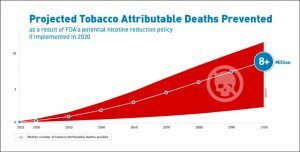 Slashing the acceptable levels for nicotine will be a significant task, if it can be accomplished, as the FDA earlier had said it planned to. Gottlieb has noted that tobacco use, mostly cigarette smoking, kills roughly 480,000 Americans annually and costs the nation almost $300 billion in direct medical costs and lost productivity. Based on that nicotine reduction, if put in place by 2020, researchers estimated that 5 million Americans would quit smoking within a year, with smokers plunging to 1.4 percent of the population versus 15 percent now. By the century’s end, 8 million lives would be saved. Regulators long ago ripped Big Tobacco for manipulating nicotine levels in its products to make them more addictive, a task that’s easy enough for the industry to do, for example, by changing leaf mixtures. But cigarette makers, with partisans’ support, thwarted anti-smoking advocates’ efforts to win more authority to regulate what goes in cigarettes and other tobacco products. During the Obama Administration, tobacco foes decided it didn’t make sense to try to ban nicotine, any more than it did to try to eliminate alcohol. Instead, they focused on winning the power for the FDA to regulate Big Tobacco ingredients. Gottlieb, who surprised many with his anti-smoking efforts because of his ties, for example, to e-cigarette makers, said that he saw from the outset of his FDA time that one of the biggest things he could do to improve Americans’ health was to reduce cigarette smoking. Nicotine itself isn’t the most harmful chemical in tobacco, though human and animal data support that nicotine exposure for growing young people “has multiple adverse health consequences, including impaired fetal brain and lung development, and altered development of cerebral cortex and hippocampus in adolescents,” University of California at San Francisco researchers emphasize. The greatest bane of nicotine, as smokers learn and research has affirmed, is that the chemical, along with the rituals of smoking, are habituating and addictive — so much so that, the FDA says, “68 percent of current adult smokers in the United States want to quit, and although about 55 percent of adult smokers have attempted to quit in the past year, only 4 to 7 percent were successful.” When smokers can’t quit, they’re then barraged by other cigarette toxins, including tar and other poisons caused by what’s now the least expensive and most effective nicotine-delivery system — burned tobacco. In my practice, I certainly see not the only the major harms that patients suffer while seeking medical services but also the giant toll inflicted on them by smoking and conditions it causes and inflames, including cancers, and heart and lung diseases. The FDA’s campaign to cut down nicotine and smoking deserve close watching and public support, especially as Big Tobacco fires up its big money and other major resources to resist. Indeed, in the days ahead, FDA officials not only will have to fight off interference by Big Tobacco-funded politicians, they also will need to navigate a regulatory thicket. Gottlieb correctly has asked for assistance, for example, to figure how low the agency can go with allowable nicotine levels. The agency also can’t fully anticipate consumer reactions: Will smokers simply puff more lower-nicotine cigarettes to make up for their nic fits? Can the agency stomp out illicit, high nicotine products that may flood markets? It’s good that the FDA plans, too, to attack menthol and other flavored cigarettes and premium cigars. But what will happen with vaping and e-cigarettes, a trendy and popular practice among the young with varied devices that more and more look like a gateway to tobacco abuse? The FDA, with much criticism, has delayed action on e-cigarettes. Others, too, are racing into a potentially lucrative market, with schools, teachers, and public health officials wary now about the booming popularity of the Juul. It’s a smokeless product, which can be mistaken for a small, colorful computer flash drive. It provides young people a wallop of nicotine in a quickly dissipating cloud of mango, mint, or crème brulee odor. The devices, pricey and purportedly restricted to adults, pack in a single pod with 200 puffs the equivalent nicotine in a pack of cigarettes. They’re making deep inroads among trend-setting, affluent high schoolers, who don’t see their use as vaping or problematic: It’s “Juul-ing,” and some older teens are selling it to freshmen for $5 a puff.